I really didn't expect to learn this much this quick; it was definitely worth every penny! The teacher was awesome and made the learning easy and fun. I would definitely recommend this course to anyone when asked. Thanks for the opportunity and experience. Now I know I am a "true" tinter! Happy Birthday Teach!!! Me and my brother were so determined to both learn this trade, we came all the way from Amarillo Texas; we were very pleased with the decision we made. Our teacher made everything fun and informative! 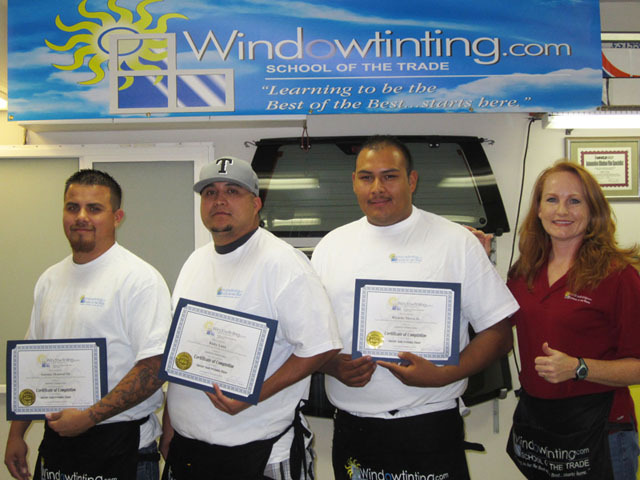 Thank you, Windowtinting.com…Happy Birthday, Teach! Personally, I have a hard time learning by a “book”, so having a teacher next to me and guiding me when I had a hard time preparing my initial installation just made the class that much easier for me to understand. Oh, and Happy Birthday Jaymi!! !